Jalen Rose, a 13-year veteran of the National Basketball Association and a member of Michigan's "Fab Five" basketball team in the 1990's, delivers a message in "For Brothers Only" about the importance of voting in the upcoming presidential election. The basketball analyst (for ESPN and ABC-TV) and Barack Obama supporter explains why he is taking this election so personally and why he would be "blessed to witness the first African-American president." Why I Take This Election Personally … With the campaign at its end, it’s your responsibility to stand up and be counted. As African Americans, we are all here because somebody marched for us. We are all here because people sacrificed for us and we all stand on the shoulders of giants. I know I’m standing on the shoulders of those who sacrificed their time, energy and passion to fight racism. With the 2008 presidential election, it is time we all unite and vote to make a difference, not only for ourselves, but also for future generations. Our ancestors gave up much so that we could have the right to vote, and those sacrifices should not be in vain. It wasn’t long ago that segregation permitted separate water fountains and washrooms for different races. The real change didn’t come until the Civil Rights movement of the 1960s, when the last of the racial restrictions were finally removed. Just think, that was less than fifty years ago. I know we often wonder how much our vote really counts, and I understand the average person may not follow politics daily. But educate yourself before Nov. 4 so you can make an informed decision. If you’ve never voted in a presidential election, now is the time to start. This election can -and will- affect your future. I’m pretty confident if you do your research, you’ll understand why I jumped on the Barack Obama bandwagon-not just because he has a nice left-handed jump shot that I can relate to, but because he is a qualified candidate. He isn’t jaded by the negative history of politics and he is a charismatic family man, a man who isn’t afraid to present fresh and new ideas. I am moved by Barack Obama because he is intelligent, responsible and presents a dynamic platform. His plan is to put the middle class first by growing the economy, creating new jobs here at home, investing in education and cutting taxes for working families. Obama will ensure the economic security of middle-class families in the short-term, and restore balance and fairness to our economy, making sure that Americans aren't just getting by, but getting ahead. I’m taking this election personally. Our country is in the worst shape it’s been in. People are losing their homes to foreclosure, innocent victims are dying at war, gas prices have skyrocketed and this may only be the beginning of these hard economic times. If we don’t want things to continue down this path, we need to make sure Obama has the chance to implement change. I would feel very blessed to be able to witness the first African-American president. If Obama is elected, I know he can have a positive impact on the entire world and continue to open doors, not only for me, but the entire Black race. Robert F. Kennedy predicted 40 years ago that we would have a black president, and now we have a legitimate, viable candidate. Don’t take the opportunity to vote for granted. As Obama puts it, believe in your ability to make areal change – VOTE! See you at the polls. 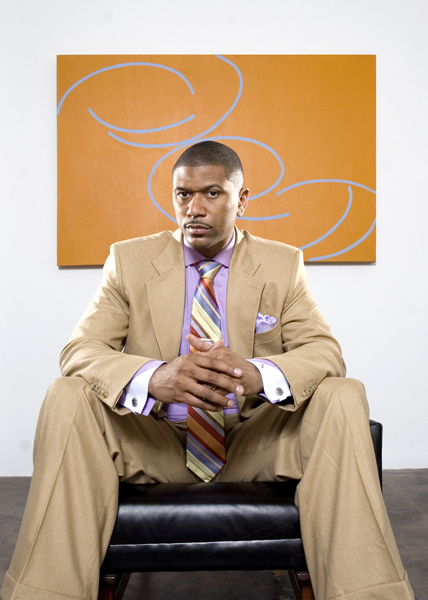 – Jalen Rose, a current ESPN/ABC basketball analyst, was a 13-year NBA veteran and a member of the University of Michigan’s “Fab Five” starting lineup in the ’90’s.